This time last week we talked about campaigns and introduced the new Survival Horror mode to you guys. That certainly raised a few interesting questions in the comments – not least of which were those regarding character deaths and how they might affect the party. With these queries in mind, this week we’re going to deep dive into bosses and see if we can clear things up, as well as tell you a little more about these fearsome adversaries. When it came to designing enemies for the Resident Evil™ 2: The Board Game, bosses presented more of a challenge than more common enemies. They needed to stand out as unique and unpredictable foes, with a wide variety of signature attacks that force players to adapt their strategy when facing them. Fortunately, we already had a solid idea of how to represent these formidable adversaries, right from the start of the project. Initially we sat down to watch each boss encounter in exacting detail, taking note of every animation until we had a strong idea for how each boss moved around and attacked. Then, borrowing a game mechanic we’d used to great effect in Dark Souls™: The Board Game, we fed these into behaviour cards, creating a set for each boss. These formed the basis for signature behaviour decks, allowing us to very quickly establish a unique identity for each of these infamous foes. Our next step was to apply overarching themes to the decks and add some special rules for the bosses to further push their individuality. Let’s take a look at Birkin Stage Two and discuss that in a little more detail. The first thing that our design team noticed during Birkin Stage Two encounters in Resident Evil™ 2 was the speed at which the boss stalks about the playing area. It might come as a surprise to you guys (it certainly was to us!) but Birkin Stage Two is fast. Furthermore, attacking doesn’t cause him to stagger or break his stride – at least, initially. Birkin Stage Two can take a real beating, but once his health has dropped below a certain threshold, the boss is reduced to limping around after the player and his attacks are much easier to evade. The Resident Evil™ 2: The Board Game adaptation of Birkin Stage Two has two special rules to represent this. The first is named Relentless, and means that before drawing a card from the behaviour deck the boss always makes a move towards the active character. This keeps the boss surprisingly mobile, especially considering some behaviour cards also give Birkin Stage Two a move action on top of that. Our advice? Keep moving, and don’t let him get too close! Which brings us nicely to character death. When a character’s health track is reduced beyond Danger in Resident Evil™ 2: The Board Game, they are rendered unconscious. This doesn’t end the game for the players – provided there is a First-Aid Spray to hand, the unfortunate survivor’s allies can race to their aid and get them back on their feet. If not? The fallen character bleeds out and dies, meaning the game ends in failure. This adds tension to both standalone and campaign games for players, but for the latter also ensures players won’t have to skip sessions because their character has died. When a boss renders a character unconscious however, things are a little different. In addition to the special rules on their reference cards and in their behaviour decks, bosses have a few extra universal rules to keep in mind. To start with, bosses are extremely physically dominating. They cannot be pushed – furthermore, if a boss enters a square with other models in it, those models are pushed out of the way as the boss shoulders its way past. 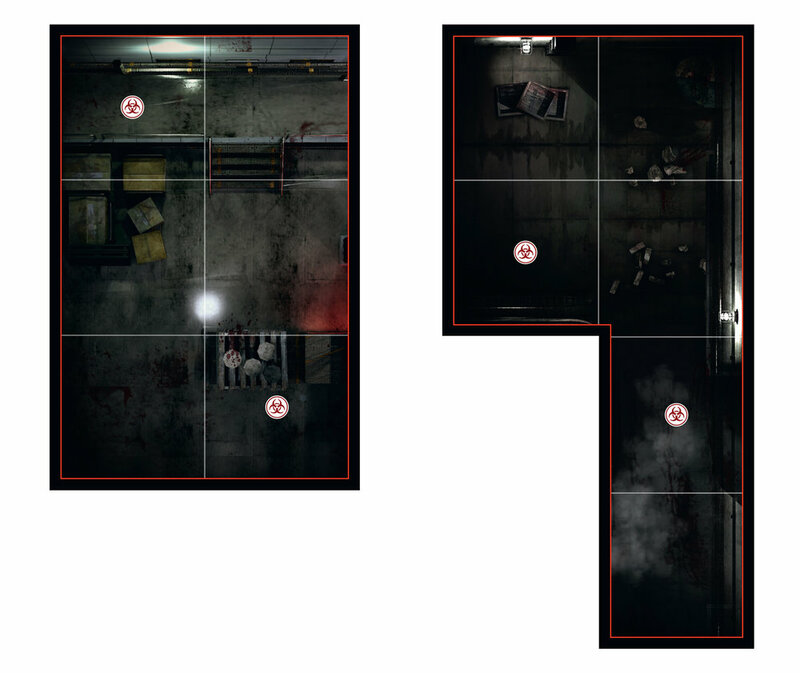 In addition, once a character enters the same tile as a boss, they cannot leave – boss encounters in Resident Evil™ 2: The Board Game are just like the original videogame, there’s no escape! But probably the biggest difference between bosses and regular enemies? Bosses can kill survivors – the most potent of attacks are able to do so in a single hit, in fact. This doesn’t cause the game to end in failure… but it does mean players have to be extra careful. Let’s say your group survives the encounter, but one of your number has died. Do you progress and hope to find another survivor, so the player can join in again? Or perhaps you use up one of your precious continues? We’re back again with some more tile artwork for you guys, and this time around some more generic tiles for you. Where do you think these dark and shadowy areas could be found?